As a native San Franciscan, I’ll always have fond memories of the Exploratorium. Nick and I have been members for the past two years, and though we don’t go often, we definitely feel it’s a fantastically educational, worthwhile place to visit. Next year, it will be moving to a shiny new facility on Pier 15, where hopefully many more people will know about it and be able to share in its awesomeness, but we’ll always have a special place in our hearts for where it is today, at the Palace of Fine Arts. Today, we had to bring our car in for service and our mechanic is just around the corner from the [current] Exploratorium, so we decided to pop in for a visit. Last time we were here, it was our first time going to one of their newer “After Dark” events – and we saw a cute little space we had never seen before, called “The Tinkering Studio.” It looked really interesting, but it was closed. 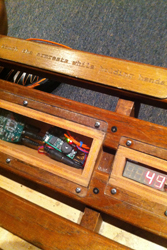 It has specific hours within the Exploratorium hours, and for our event, there was no one to man the studio. 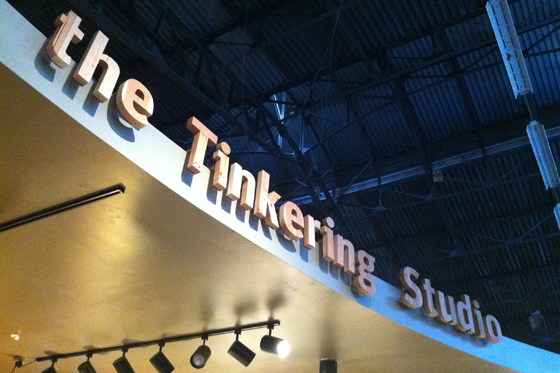 Today when we visited, the Tinkering Studio was open! Yay! The Tinkering Studio opened in 2009 inside the Exploratorium, and its purpose is to encourage “playful invention, investigation, and collaboration.” The Exploratorium is all about hands-on science, but this space is for people to be able to sit down for an extended amount of time, to explore, to tinker, and to create something. While it wasn’t as buzzing with activity as it can be (there’s a great video of the space in action on the Tinkering Studio website), there were still some pretty cool things there. 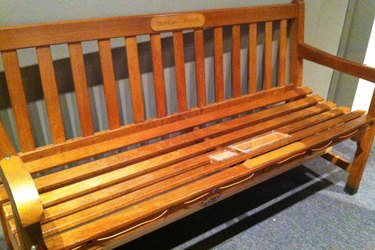 There was the “Musical Bench” where you and a friend could be the medium that power for the music would be conducted through. When you sit down, you hear a few random notes, but if you each put a hand on an armrest and hold hands, music plays! This was just like when I did the experiment at home a while ago where I powered a clock with a lemon. We were the conductors (ha ha ha! Pun totally intended!) that closed the musical circuit! Very cool. 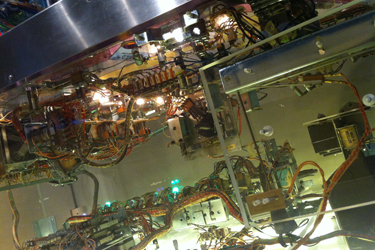 There was a pinball machine you could play for free … that was completely clear, so you could see all the circuitry and inner-workings, as the game was being played! 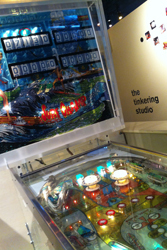 Pinball machines are so much more complicated than “regular” video games, because there are moving parts, electrical parts, and with today’s machines, computer parts, as well! 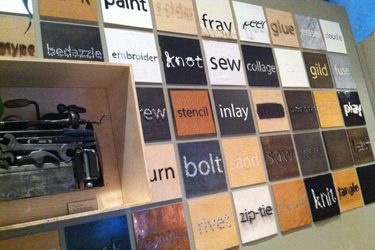 There were also examples of artists’ work that inspired different exhibits at the Tinkering Studio. 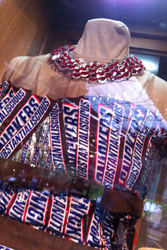 This hand-made automaton was so awesome – and the recycled fashion from throwaways was really cool. We even got to make a stop-motion animation with their setup – though we didn’t get to make it as cool as we would have liked because we didn’t want to hog the space for too long. 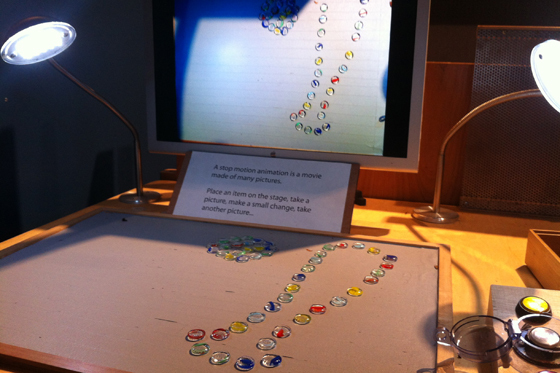 And the Exploratorium lets you post your animation on YouTube! Let’s go, Giants (if you rewind the video to the very first frame, it’s the “SF” logo)! 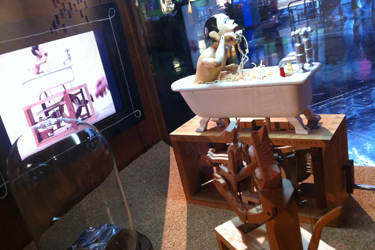 The Tinkering Studio is a fantastic addition to the Exploratorium. I’d love to go back when there’s more activity, although I’m totally glad we got to go today when it wasn’t too crowded. If you’re in SF, you must visit the Exploratorium. It’s one of the most wonderful learning centers ever. Very cool! 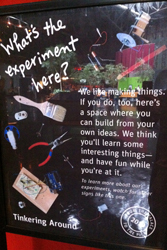 The Exploratorium rocks!! !